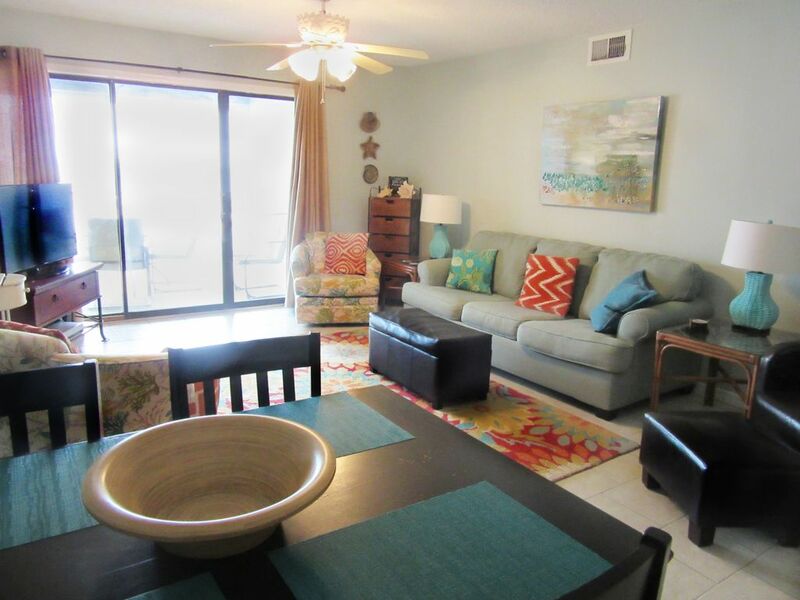 Updated, Bright and Spacious Beachside condo with 2 king beds! Small, family friendly complex with grassy play area, gazebo with barbeque area, and beautiful white sandy beach. Large balcony is available for your enjoyment. No long waits for the elevator. Beach area in front is wide, and the complex is small so there are usually no big crowds at the beach. Easy access to the beach down the boardwalk at the west end of the complex. The view is obstructed by homes in front of the complex, but most people love this location because it’s so close! Easier than walking through the lobby at the big high rises. As of March 2019 there is construction in the front of the complex, so rates have been reduced to compensate. This condo was recently updated with new slab granite in the kitchen and baths, new sinks and faucets in kitchen and baths.New Refrigerator and Range/oven. New sleeper sofa and chairs in living room. We also added flat screen smart TVs in the living room and bedrooms.. Interior of condo was painted and updates in 2017/2018. The condo is walking distance to Adventure Island, shopping, and restaurants. Unit is well equipped with 3 televisions, , and one DVD, games, and movies, as well as loads of pots and cooking utensils. Living room, kitchen, and master bedroom have a view of the gulf. The location of this condo is great. You can walk right out front to a souvenier shop, and across the street to Adventure Island for go carts and putt putt or to Bubbas seafood restaurant for great fried shrimp! There is also another new arcade/pizza parlor right across the street. The location can't be beat! One of the last of its kind, a small complex among all the generic high rise condos. This is the perfect place for a family, or couple wanting a quiet place to stay. We have a lot of repeat renters that come back year after year. There is an obstructed beach view, and the atmosphere and location can't be beat. There is a view between the houses that are in front of the complex. The beach is closer and easier to get to than from the high rise complexes , walking through the lobby. There is a nice boardwalk. obstructed view, wide 600 foot beach area in front. It is usually not crowded. Stackable washer and dryer, new as of 2017. Assigned covered parking for 2 vehicles back to back, at no charge. Additional parking first come first served, near the pool. 8 towels and washcloths plus 2 hand towels are provided. These are high quality linens, not typical. This property is on the 2nd floor, parking is beneath the building, so it is an easy 2 flight walk up or you can use the elevator. There are carts to put your luggage and groceries on to bring up. All dishes, bakeware and silverware provided. Kitchen has new appliances, new counter tops, new ceramic tile floors, and is fully equipped with most things you would need during your stay. There is also a crockpot. Dining area has 4 chairs plus 2 counter height stools at breakfast bar. Ashley, I am so sorry that you were not aware, I was careful to call everyone that had booked before I found out about it. I also changed pictures online and reduced the rates. You booked right after I did it, and I guess, did not realize it. I have just sent messages to my upcoming bookings so no one is surprised. We are a very good value, as I have reduced the rates while this is going on. Great location and direct line of site to the beach. Parking was great for 2 vehicles and they have carts and an elevator to get your supplies to the condo. Linda (the owner) checked with us in advance and answered all of our questions and checked on us during and after the stay. I will keep this on my list to return. It was so nice having you as our guest! Hope to have you back soon! Thanks so much for the great review! We love the location and the large balcony too! Look forward to having you back! Place was nice and clean. Dishwasher didn't work, but everything else was great. Would stay there again. Walked to beach every day; when we were in the condo, we were overlooking the gulf from the large patio. I'm glad you enjoyed your stay! Sitting out on the balcony watching the waves is one of my favorite things to do too! Perfect condo for my husband and I plus his sister and brother-in-law. Condo was fine, weather a little cooler than expected. Houses blocked view of ocean to the right somewhat but not enough to be a problem. Would definitely stay again.